It's week 44 of the Bloggers Challenge - and this week brings a Color Challenge. 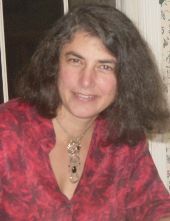 Colors to use this week are Certainly Celery, Brocade Blue, So Saffron, Chocolate Chip, and White or Vanilla if needed. Color Blocking (10/02 TJNL) came to mind - it's the perfect technique for adding colors to your cards. 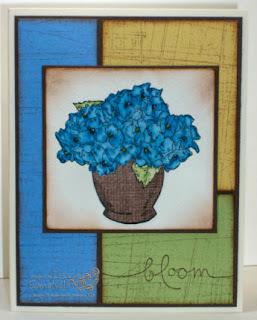 I stamped my image from Bloomin' Beautiful in black stazon on watercolor paper and water colored my flowers with Brocade Blue, the centers have a bit of So Saffron, and a dot of Crystal Effects to make them pop. The leaves are colored with Certainly Celery. For the vase, I stamped my image on my Afternoon Tea Designer Series Paper, cut out and adhered to my stamped image. I used my sponge dauber to add Chocolate Chip ink around my image. I inked my Sanded Background stamp with Chocolate Chip, stamped off a few times, then lined up my color blocked pieces and stamped my image. The sentiment from Bloomin' Beautiful is also stamped in Chocolate Chip. Brocade Blue 5-1/8" x 1-3/8"
So Saffron 3" x 2-3/8"
Certainly Celery 2" x 2-3/8"
Chocolate Chip 5-1/4" x 4"
Be sure to check back tomorrow - as I'll be sharing some sneak peeks of the upcoming new releases from Artistic Outpost. Wow! I want a vase of flowers that look just like this! So pretty! Very nice card - the colors look great together! I wondered how you got the brown sanded look - I didn't realize you could buy a stamp like that. Oh so pretty! Love the texutred look. Oh wow Lisa...this is fabulous. Love the flowers in that color. Spectacular! Stunning card, Lisa! I love the paper pieced vase and the vibrant colors! Great card; looks like a lot of you used color blocking this week which I love seeing! You know I'm totally digging the panels Lisa! Gorgeous! Lisa, Love the colors! Really like the new blog layout as well. thanks for sharing. Love the color blocking... Great card! I love how the color blocking draws attention to the stamped image--beautiful! Wow, this is wonderful. Now that the catalog was extended I so wish I would have purchased this beautiful stamp. Great card. Absolutely beautiful! The flowers are so vibrant and realistic!